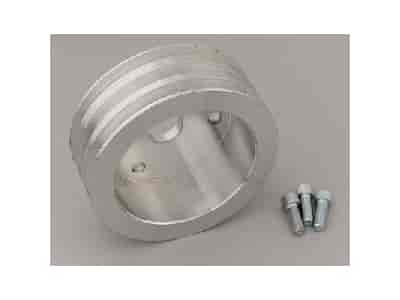 March 1971-1982 Corvette Small Block V-Belt Pulleys are precision CNC-machined from solid billet aluminum for 1971-1982 Chevrolet Corvette small block engine applications. These pulleys have their own unique V-spacing and must use original 1971-newer brackets and water pump. They are computer designed for this specific application assuring that the electrical and cooling systems function properly while your engine runs easier, the no-slip deep grooves eliminate belt squeal and throwing! Increases horsepower by reducing accessory drag (typically 12.5 HP at rear wheels) and eliminates belt throwing. Designed for normal street driving. Aluminum Pulleys are precision machined from 6061-T6 billet aluminum for extra strength and wear. They are hand polished and powdercoated clear or black for a maintenance-free finish. 5051 - March 1971-1982 Corvette Small Block V-Belt Pulleys is rated 5.0 out of 5 by 1.